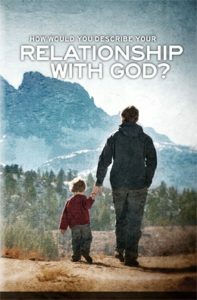 Why would an infinite God even want a personal relationship with someone like me? Honestly, I don’t think that I can answer that question. Yet He is very clear in showing that He really does want me. It is not that I am such a great person and God desires me because of what a great friend I can be to Him. He was doing just fine without me and, yet, the evidence of Scripture is that He clearly desires for me to get to know Him. He has gone to great personal expense to make a friendship with Him possible even when I have made it quite clear, on multiple occasions, that I want nothing to do with Him or His ways. In fact, the relationship which He wants with me goes far beyond that of wanting me to be His friend. He wants to adopt me as His own son! How is that even possible? I mean, really, how could I have such a relationship with somebody I can’t detect with my physical senses? The answer is that it starts out by correspondence! Imagine that God has written a letter to you and in it He describes to you everything which you need to know about Him. Sadly that letter is written in a language that you can’t understand. Thankfully, God has sent an interpreter who will teach you how to understand if you really want to know. Where can I find this Friend? Stop imagining!!! This is real life. God has written to you a really, really long letter about Himself. It is the Bible. Perhaps you have read a portion of it before or maybe even the whole thing and yet it makes little to no sense to you. That is because it is written in a different language! It is not written to be understood without an interpreter. That interpreter is the Holy Spirit. Not only will He explain the meaning of it to you, if you really want to know, but He will also confirm to your heart that the words written in the Bible are not just somebody’s opinion but the Truth of God. God promises that those who seek Him will find Him, if they search with all of their heart. The best place to start looking is in His letter to us. The Exchange Bible study examines who the God of the Bible really is and what He is like. In a four week study together, we will look at how to have a personal and meaningful relationship with the Eternal One. Each week, my wife or I will meet with you for one hour to go over with you what you have discovered and discuss any questions you might have. We want for this to be a time where we can get to know each other in a comfortable setting. It is designed to be a time for dialogue and not just monologue. Perhaps at the end of our four sessions you will disagree with what the Bible says about God, but we want to be your friends either way. God knows all about you. It is time for you to learn about Him. Perhaps you think you know a little bit about Him already. Would it hurt to learn a little more? Let’s look in the Bible together and see how God describes Himself and how He was made a way for you to get to know Him in a very real and personal way. Ben Hamilton pastors Emmaus Road Baptist Church in the Bronx, New York. His passion is knowing God's will for his life, and sharing what he has learned with those whom he meets. He has lived in NYC since 2010. Ben is married to Andrea, and they have five children.